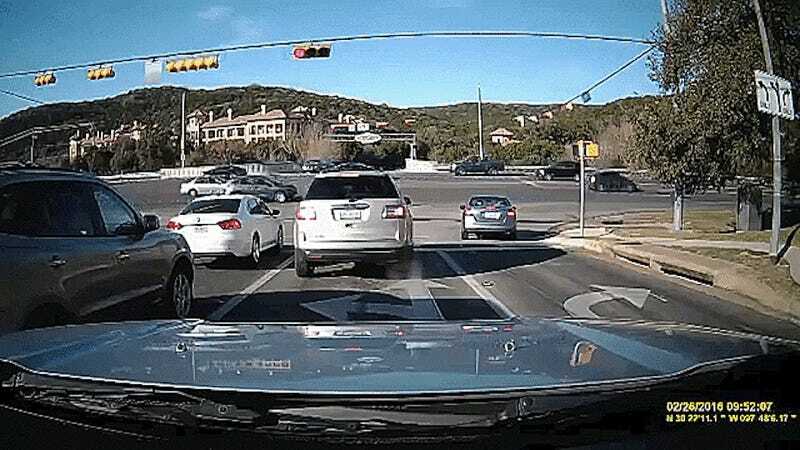 After a gravel truck in Texas plowed through a red light, into several cars at an intersection and over a drop off, an injured driver filed a lawsuit against the company that owns the truck. The case just began, but a lawyer defending the driver already argues that the truck should never have been on the road. The crash occurred at an Austin intersection in February and the truck involved belonged to Franco’s Trucking, according to local news station KEYE TV. The wreck looked near fatal from the dash-cam video recorded at the scene, but no fatalities resulted from the incident. Six people did sustain injuries in the crash, and the truck fell 15 to 20 feet into a creek bed after driving off of the road. The driver in the lawsuit is a local college student, 19-year-old Delaney Nelson. Nelson was on her way to class at the time of the crash, and KEYE TV reports that being t-boned by the truck led to spinal injuries as well as embedded glass in her face and eardrums. In a lawsuit seeking at least $1 million and a jury trial for the medical bills, Nelson’s lawyer Justin McMinn told KEYE TV that the dash-cam video is crucial to the case. The lawsuit lists the driver, Codie Korn’s felony record and the twenty safety violations against the truck’s owner Franco’s trucking in the last 15 months according to the Federal Motor Carrier Safety Administration. According to KEYE TV, an Austin Police Department crash report also found that the brakes on the gravel truck failed. The station added that “there were other factors in the crash as well,” but did not list any other than the ones above. McMinn said the case came about so quickly in order to not lose evidence from the incident, such as an inspection of the gravel truck. As for Franco’s Trucking, the company did not respond to KEYE TV for comment on the situation.